Men's Claddagh Ring : LOVE2HAVE in the UK! This Claddagh ring is the most stunning of all the Claddagh rings we sell. It is a men's zirconium ring featuring a fantastic, outer laser engraved Claddagh symbol. The designer has given the traditional Claddagh symbol a nice clean cut contemporary feel, and we would also say an almost Gothic quality to its styling as a good proportion of the ring is all back in appearance. 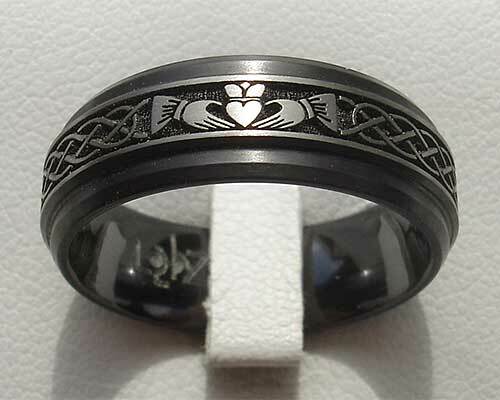 The ring also features a Celtic knot design, again quite bold in a design sense. Most people have heard of the Claddagh symbol, but just to clarify it represents love and friendship. It is a two-tone design with the patterning enhanced by the machine lathing away the black zirconium surface to reveal a very striking two-tone relief. The lathing technique also produces the shoulder cut stepped profiling too. Buying a Claddagh ring for a man can be somewhat problematic when it comes to choosing a design that men like, but at Love2Have we think we have the answer when it comes to style with this zirconium ring with a Claddagh laser engraving. The designer has advised us that the engraving for this ring takes an hour to complete. The engraved surface itself is quite textured, therefore adding to the symbolism depicted. The ring's width is 7mm, and it is available in a satin or polished finish.